Tipping is a way of life in Eygpt. If you are there on a trip and the locals do something you consider out of there way or an extra effort you should tip them. Alot of local Eygptians live on very little so they depend on tips from tourist to survive. on the other hand never tip a bussinessman or high end type that consider them selves you equal to do so would offend them greatly. Eygptians if offered anything will refuse the first invatation therefor you should do the same. If the offer is sencere and not just of politness it will be repeated. Another thing is if you are invited in to a home and have to ruefuse the offerer will mostlikely try to press you for a promise to return in the future for a meal of some sort. if you promise it is imperitive that you arrive of your would be host would be hummilated. 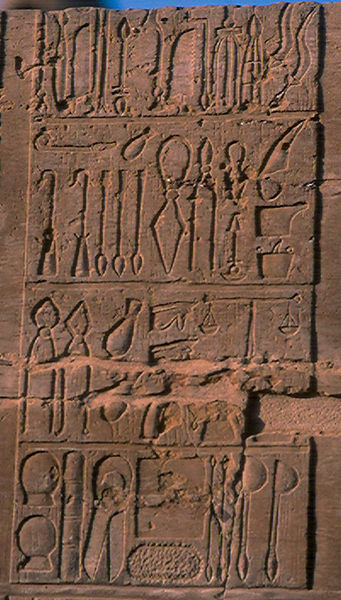 This is a sample of the writings used by the anceint Eygptians. 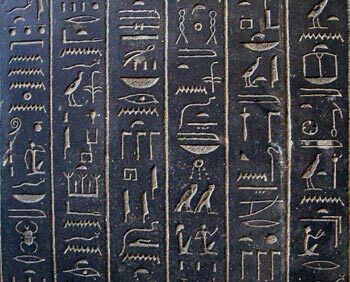 this form of writing is called hyroglyphs and it is one of the first recorded writing styles. Here you se a set of medical tools as the anceint Eygptian were well know for there medical technology. they had a basic understanding of the human annatomy before most any other civalizations.